Song of the Month Club! At the beginning of 2016 we launched our Song of the Month Club at Patreon.com/HeatherAndMarty . We enjoyed the challenge of recording a new song each month and we appreciate the positive feedback we received. We want to thank everyone again for your interest and support. We're happy with our progress so far and look forward to continuing to regularly create and record original music. Our Song of the Month club is a value for value situation; for as little as $5 you get exclusive recordings of our new songs and our production costs are covered by your monthly pledge. This gives us the opportunity to focus exclusively on creating new music. We would love to have more donors helping us reach our goals of updating our recording equipment and releasing our 2nd CD later this year! So now is your chance to join our endeavor! Once you've signed up please share with a friend who will enjoy being part of Heather & Marty's Song of the Month Club! Check out our page at Patreon.com/HeatherAndMarty to join and get more info on the rewards you can get for your monthly pledge. Celebrate with us! We are officially releasing our 2nd CD of original songs on November 18th at 7:30 at the Effingham County Courthouse! We're looking forward to spending Labor Day weekend in the Lake Geneva area playing at the Shore Club on Saturday and Sunday evening. This will be our 5th trip up there this year! Then on Monday we'll be more local again, at the St Elmo Labor Day Festival from 12-3. Great Gatsby Gala in October! Get your tickets now for the "Adult Only Prom" happening at the Austin Mansion in Effingham on Saturday, October 8th! $45/person includes a Cash Bar, Hor d'oeuvres, Live Music by Heather and Marty, Poker Tables, A Photobooth, and even a King and Queen crowned at the end of the night! Doors open at 7PM. Wear your favorite Gatsby inspired attire! We hope you all have been enjoying the recent cooler weather and look forward to seeing you soon! This weekend we'll be traveling up to Lake Geneva to play at the Shore Club (on Saturday and Sunday evening). It's a great venue with wonderful food and libations. We had the pleasure of playing there on Memorial Day weekend and will be back for a weekend in August and again for Labor Day weekend. If you or anyone you know will be in that area, stop by and say hello! We had a great time playing at the 3rd annual Moccasin Creek Festival last weekend and enjoyed listening to loads of great musicians! We also played a few songs with our friend Greg Klyma during his set. It's so great to have an event of this caliber right here in Effingham! Check out our post show interview HERE with Casey Tibbs from Image Squared Marketing. We also got to be a part of the 46th annual Sacred Heart Picnic. Thank you to everyone who braved the heat along with us! The summer keeps rollin' out good times for us and we hope it's the same for you! It's been a fun and busy June for Heather and Marty. We enjoyed playing for a wedding in an apple orchard near Gary Indiana earlier this month which was a scenic and unique experience. Last Saturday we had the pleasure of performing at the First Annual Sips and Sounds Wine Fest in Flora at a great new event venue, Johnny and June's. Our friend Richard Rudy was the opening act and put on a great show! Check out the pictures. The fun continues this weekend with the 3rd annual Moccasin Creek Festival! We are opening the events on Saturday at 11am. If you haven't already purchased your tickets, it's not too late and check out the great weekend lineup. 3 Days of great original music! And stop by the songwriter's open-mic at Village Wine this Wednesday for the Moccasin Creek Pre-party! We're on at 9:15pm. Later on Saturday you can join us for a wine tasting at the Sacred Heart Picnic. We are playing from 5 to 7pm and look forward to returning hopefully to clear skies after playing in the rain last year! We hope everyone is having a great summer so far and we'll see you this weekend! You can help us create music! Patreon.com/HeatherAndMarty and we're now ready to offer a special for new members! If you join before the end of this month, you'll receive April's release + the first 3 songs for free! What is Patreon.com? It's a website that gives fans the opportunity to directly support creators with a monthly donation. For as little as $5 per month! We want to thank everyone for your interest and support. Our Song of the Month club is a value for value situation; you get exclusive recordings of our new songs and our production costs are covered by your monthly pledge. This gives us the opportunity to focus exclusively on creating new music. We would love to have more donors helping us reach our short term goal of purchasing professional lighting for videos and live streams, and our long term goal of releasing a 2nd CD. So now is your chance to get 3 extra songs! 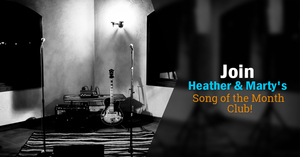 Once you've signed up please share with a friend who will enjoy being part of Heather & Marty's Song of the Month Club! Sunday afternoon at Roundhouse Wine Company in Centralia. This is our first timeand we're note sure what to expect but we enjoy the adventure of a new gig. It's always a plus when we bring new customers to our out-of-town shows. So help us make a good impression and enjoy wine and music with Heather & Marty on a Sunday afternoon. Doesn't that sound nice? We'll play from 2-5 pm. H&M at Village Wine - Friday! This Friday we'll be at one of our favorite local venues; the Village Wine Shop in Effingham. They have a great wine and craft beer selection that perfectly compliments the music of H&M. If you've been to one of our shows lately you already know we've added 5 brand new original songs to the set. If you didn't know this, it's time to get out to a show -- you're behind and need to catch up! We had a great time at the Holiday Inn on Saturday and appreciate all of our friends that were able to make it out to the show. We also enjoyed debuting a brand new original song called "On the Ride". This weekend will be chock full of Valentine shows! On Friday evening, we will be performing locally at the Austin Mansion for a special "Valentine Table for Two" event. Click to read the history of Austin Mansion. Then, we will head up to the Lake Geneva WI. area for Valentine dinner sets at the Shore Club on Saturday and Sunday. Happy Valentine's Day! We look forward to seeing you soon! Holiday Inn Sat. - NEW song release! "Addie Lee you're a mystery..."
This weekend starts our first of many gigs for February. We're looking forward to being back at the Effingham Holiday Inn this Saturday evening. The show starts at 7:00. Join us there and enjoy music (including a couple of brand new songs) while you dine or relax with a cocktail. In songwriting news, we're happy to announce that we've delivered the first gifts of our Patreon crowdfunding campaign. Our patrons have received mp3s of a new original song called "Addie Lee" as well as other goods depending on pledge level. We'll be releasing one new song per month. To get an early copy while helping us cover recording costs please visit our Patreon page for more info. You can help out by pledging as little as $5 per month! It's looking to be a busy month for Heather and Marty. Stay tuned for more news in our next installment. On Friday, I (Marty) will be in Chicago to play with my super awesome part-time rock band Hello Dave. If you've never heard Hello Dave, they have 5 CD's of original rock and roll. I played on the Chicago Twang album. The show will be at Joe's on Weed St. and is a fundraiser for a horse and animal rescue organization called The Farm Way. Hello Dave frontman Mike Himebaugh founded The Farm Way in 2014. On Saturday Heather & Marty will be playing Christmas songs at Mfred's Guitars & Guns in Mattoon from 1-3pm. Recently, we've been hinting that Heather & I have a new project that we're excited about. In the spirit of Christmas, we're calling it a gift exchange. It's a crowdfunding idea (similar to Heather & Marty's "Back to Me & You" CD and Marty's "Christmas at My House" CD projects) but instead of one lump sum for a CD, it's a small ongoing monthly pledge. In exchange for the pledges, we'll write and record approximately one new song per month. All production costs will be paid for with money we receive from monthly donors. It's a win-win, value-for-value situation. By supporting our music with a patronage system, we have both opportunity and motivation to write songs on a regular basis. Think of it as monthly commissioned art. The patronage system was common in Beethoven's time and much of his work was funded by either wealthy art enthusiasts or the Catholic Church. Thanks to the internet and Patreon.com we can now do this by crowdfunding smaller pledges. We hope you'll take the time to check out our page at Patreon.com/HeatherAndMarty to see the rewards we are offering in exchange for your continued support. Even $5 per month would go a long way towards reaching our goal! Please forward this email to anyone that might want to gift exchange with us. First and foremost, I accidentally double-booked us this Friday, and we regretfully had to cancel the show at Village Wine. I'm sorry for any inconveniences! We will, however, be in Sainte Marie at the American Legion for their 11th annual Wine Tasting this Friday from 7:30 - 10:00 pm. A $10 donation per person at the door includes a special wine glass, tastings, finger foods, music, fun and games! In other news, we are getting super excited about a new Heather & Marty project! As the holidays approach, we thought it would be a great time to start a gift exchange. It will be a way for US to share new original music in exchange for valuable motivation and support from YOU! That's it for this week. We hope to see you on Friday! H&M at Village Wine Fri. & NEW songs! We're getting ready to take a little break in November to focus on writing NEW SONGS! However, you can still get your H&M fix this Friday night at Village Wine & Gifts! Please check out the event on Facebook: https://www.facebook.com/events/1487483978219969/. After this show, we'll spend the rest of the month working on new material. So expect to hear brand NEW originals very soon! H&M at Holiday Inn - Sat. We had a good turnout at the Leo French park concert Saturday, despite the chilly weather. It was one of the most attentive audiences we've ever played for! Nobody talking during the performance, just music. So nice!!! Thanks to everyone who came out to enjoy the show. Look for the Fairfield Park District to host a full concert series next year. This Saturday, we're playing at Holiday Inn, Effingham from 7 - 9 pm. With the weather cooling off, we'll probably be playing inside. Come on out and enjoy a relaxing evening at one of Effingham's finest restaurants! Check out the event on Facebook: https://www.facebook.com/events/1155699794447755/. Considering attending? Click on "join" to add the show to your calendar and get a Facebook reminder the day of the event. If you join and don't show up, we won't hold it against you! That's it for this week! We hope to see you this weekend. H&M - Concert at Leo French Park, Fairfield, IL - Sat. This Saturday, we'll be playing at Leo French Park in Fairfield, IL from 5:30 - 7:30 pm. The Fairfield Park District is hosting the event, and they're excited to invite the community out to enjoy the FREE concert and check out recent improvements to the pool and the walking trails around the lake and amphitheater. We'll be playing in the amphitheater, which is near the pool. Get details for the show and save it on your calendar by joining the event on Facebook - https://www.facebook.com/events/1126534060730111/. As you can see, this classic Fairfield landmark is looking better than ever! We're looking forward to seeing you there! There's a fun harvest picnic happening this Saturday in Newton at the St. Thomas Parish. They'll be serving bratwursts, pulled pork, pork burgers, homemade pretzels and much more from 6 pm - 11 pm. Kids games will be going on from 6 pm - 9 pm. The beer garden opens at 6 pm, Quick & Bradley play from 6:30 - 8:30 pm, and Heather & Marty will play from 9 - 11 pm. Next Saturday, Oct. 17th, we'll also be playing from 5:30 - 7:30 pm in Fairfield, IL at the Concert in the Park. The concert will be held at the amphitheater at Leo French Park. I played one of my first shows there in 1981 with my high school rock band "Hurricane!" That's it for now. Hope to see you this weekend! Look out for an event invite for the Fairfield show next week. It was a beautiful weekend for the Corvette Funfest! We had a great time playing for the Corvette crowd, and what a crowd it was! After our set, we headed over to the main stage to watch the Surf City Allstars with original Beach Boys Lead Guitarist David Marks. Check out our pictures, taken by our friend & "marketing dude" Casey Tibbs of image squared marketing, below. Have plans for the weekend yet? This Sunday we're playing at the beautiful Lake House in Vandalia. If you haven't been out to the Lake House for one of their many live music events, this is your last chance for the season. Check out the event & details Here. Thanks for checking out our pics! The show at the Lake House is this Sunday from 5-8 pm. Let us know your coming by joining the event on Facebook.